If you are wrong on the next trade, will it impair your ability to take the next legitimate trade? If so, you know you are too big. If you lose money this week or this month, will it impair your ability to trade freely next week or next month? If so, you know your risk management is too loose. The best losses are planned. A planned loss is part of playing a game of probabilities. 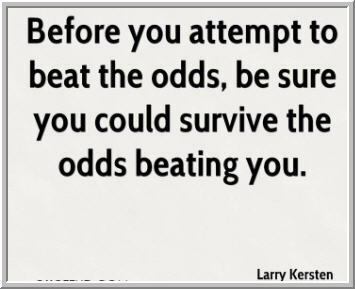 A planned loss won't prevent you from pursuing odds in your favor. Every trading slump begins with losses larger than a trader has planned and is able to digest. Are you losing the right way? Are you limiting trades to where you have demonstrated edge and then sizing those trades so that you can continue full pursuit of that edge even if the odds don't play out here and now? Losing the right way is a great means for setting yourself up to be a winner.